THRILL TO THE PULP ADVENTURE OF A HUNDRED LIFETIMES! TOMMY ONE AND THE APOCALYPSE GUN DEBUTS! Pro Se Productions, a publisher of cutting edge Genre Fiction, announces the debut of a hero unlike any other. Author John Simcoe takes Pulp to another level with the release of Tommy One and the Apocalypse Gun! When the evil Captain Blackeye unleashes his deadly new weapon on the city of Norfolk, Virginia, it's up to Tommy One, the so called Eternal Teenager, to stop the horrific plot. After the fiendish pirate-scientist shoots the teen hero dead, Blackeye thinks that at long last his plucky enemy is done. But that's not how Tommy One works! Behind every Tommy One, there's a Tommy Two waiting to replace him -- an exact duplicate with all the skills and memories of his predecessor. And if that Tommy goes, there's another to replace him! But are an unlimited supply of heroes enough to stop the devastating effects of the Apocalypse Gun? And what happens to the Tommy Infinity project when Tommy One suddenly acquires a girlfriend? And just who created this army of clones in the first place? Find out this and more as you live the adventure of a hundred lifetimes in Tommy One and the Apocalypse Gun by John Simcoe and published by Pro Se Productions! 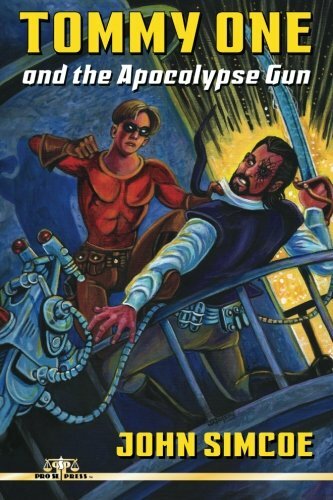 Featuring a pulpy by Larry Nadolsky with logo design and print formatting by Forrest Bryant , Tommy One and the Apocalypse Gun is available now at Amazon at http://www.amazon.com/The-New-Adventures-Semi-http://www.amazon.com/Tommy-One-Apocalypse-John-Simcoe/dp/1511542934/ref=sr_1_2?ie=UTF8&qid=1429272508&sr=8-2&keywords=tommy+one+and+the and Pro Se’s own store at www.prose-press.com for 15.00. Simcoe’s debut Pulp novel is also available as an Ebook, designed and formatted by Russ Anderson and available for only $2.99 for the Kindle at http://www.amazon.com/Tommy-One-Apocalypse-John-Simcoe-ebook/dp/B00VJAAW0I/ref=tmm_kin_swatch_0?_encoding=UTF8&sr=8-2&qid=1429272508 and for most digital formats via Smashwords at http://www.smashwords.com/books/view/532282. INTRIGUE AND ADVENTURE COME TOGETHER IN LOGAN L. MASTERSON'S 'BELTAINE' DIGITAL SINGLE! THE MASTER MYSTIC RETURNS IN LATEST PULP OBSCURA VOLUME- THE NEW ADVENTURES OF SEMI DUAL DEBUTS!